Greek prime minister Antonis Samaras has called a presidential election, which will take place this month. It’s the parliament that elects the president but if the electoral sums don’t add up – which so far they don’t – and no president is elected, then the government must call a general election. In the event of a general election, it is likely that SYRIZA – the party of the radical left – will be the largest party and will form the government. Concerns about a SYRIZA victory are expressed clearly by the stock market: the Athens exchange closed 12.8% down the day the presidential election was announced. The markets may be down, but there is great popular enthusiasm for a SYRIZA victory. Support for the party has grown hugely over the last few years because it rejects the austerity policies which have brought Greece to crisis point and will it break with neoliberalism. This will be the first workers’ government elected in Europe since the Popular Front took office in Spain in 1936. It would be a government in which the working class holds office in the parliament while the other institutions of state will remain in the hands of the ruling class. This will create a highly unstable political situation. Take the police force for example – at the last election it is said that nearly 50% of the police voted for the fascist Golden Dawn party and some in the military have close links with the fascists and have helped train their combat units. The British establishment bears a good deal of responsibility for the existence of Golden Dawn as it was Churchill’s shameful decision to turn on the communist partisans who fought Nazi Germany alongside Britain in the second world war which sowed the seeds for the rise of the extreme right in Greece today. What will this government face and what will our responsibilities as socialists in Britain be? A radical left government will face an enormous and deepening economic and social crisis. As it implements social and economic reforms, breaking with the policies that have wreaked disaster on Greece, it will immediately come under pressure from the Greek ruling class and the extreme right. It will also face external pressure too from the European Union and the international financial markets. Its central defence will come from mass support in the streets and in the communities. The social solidarity centres that have been created by the movement in the last few years will also have an important role to play. A SYRIZA government will be rebuilding a country whose economy has been almost destroyed by the demands of international capital and whose social fabric has been ripped apart. Over the last five years the Greek economy has been attacked on all sides. It has been the laboratory rat for austerity Europe. Greece has been the testing ground for the most extreme neoliberal policies contrived by the Troika – the IMF, the European Central Bank and the European Commission – which is attempting to definitively end the era of the welfare state, stamping out all social spending in the interests of the international financial system. The social and economic results are heartbreaking: the health service has been decimated. Primary health care has almost been wiped out and public health care is also non-existent. Vaccinations have stopped leading to epidemics of malaria. The budget for medicines has been cut by 70%. Pregnant women without private health insurance receive no care and are turned away from hospitals even in labour. Unemployment remains at 26% with youth unemployment almost 60%. Salaries and pensions have been slashed. More than half a million children are malnourished. Despite the harshest austerity measures the Troika are promising further deep spending cuts and a further slashing of pensions. The people of Greece have reached the end of the line with austerity and thus anti-austerity SYRIZA has become increasingly popular. Rising from 4.8% in 2009 to 27% in June 2012, the party now consistently polls higher in public opinion polls. SYRIZA had the largest single party vote in the recent European elections. A future SYRIZA government has pledged to reject the EU’s austerity Memorandum and has said it will seek to introduce significant social and economic reforms. It has promised to launch emergency programmes for food and healthcare, raising wages and pensions etc. It will repudiate the debt burden which is strangling the country. The mere election of such a government will create a wave of expectation not just in Greece but throughout Europe. Millions will be moved to action. Already the markets are anticipating a SYRIZA victory and are increasingly worried about the reforms that the party has promised to introduce. The Financial Times reported on December 9th that senior SYRIZA politicians had recently presented their economic programme to a meeting of hedge funds and banks. One senior analyst from Capital Group, a fund with $1.4tn of assets, described the programme as ‘worse than communism’ and ‘total chaos’: ‘Everybody coming out of the meeting wants to sell everything in Greece.’ Bank of America Merrill Lynch described the SYRIZA economic programme as a ‘Greek Tragedy’. There is no doubt that international investors will attempt to frighten the Greek people into rejecting SYRIZA in a re-run of the project fear that enabled the conservative New Democracy party to gain a narrow victory in 2012. The Wall Street Journal has called SYRIZA leader Alexis Tsipras ‘the Hugo Chavez of the Balkans’ saying that his economic programme will set him on a ‘collision course with the rest of Europe’. This will be true in terms of the European elites – but not with the people of Europe. Of course there is a possibility that the stakes are so high – support for Podemos in Spain indicates that the trend of resistance to neoliberalism is not confined to Greece alone – that European capital will seek a compromise. Some reports suggest that Angela Merkel will agree to a comprehensive Greek bailout if SYRIZA sticks to its position on debt write off. Such an option is fraught with problems for Mrs Merkel, not least the boost it would give to far right German nationalist forces, objecting to what they see as payouts to southern Europe. If this happens it would be a remarkable development: European capital would have been forced to end its ultra-neoliberal experiment in Greece and thus its death knell would be sounded elsewhere too. There would be a potential for the unravelling of the austerity narrative that the left must be ready to seize upon. But as things stand currently, we must be prepared for a SYRIZA government to come under enormous attack. And if and when it does, the defence of this government – that has pledged to increase public spending, renationalise services and restore pensions, wages and jobs – will doubtless be the priority for the whole movement in Greece. And it will have to be so throughout Europe too. The anti-austerity measures that a SYRIZA government will seek to introduce can only be won and defended through mass struggle. The might of international capital has to be confronted – a potentially overwhelming task, but the last two years of surviving and fighting back in the context of extreme hardship mean that the Greek people have already built strong foundations and structures of community solidarity and resistance. The self-organising social solidarity centres and initiatives which have sprung up all over Greece, in which SYRIZA plays a major part, provide social pharmacies, food distribution with farmers bringing food directly to the people, mental health care, drop-in centres, social kitchens, skills shares and much more. In essence, everything that communities need to support and sustain themselves: already these are centres of working class social and economic resistance and will no doubt develop as centres of political resistance in the event of a state onslaught on a SYRIZA government. It is in this arena that a government of the people will be defended by the people. The Greek people have led the struggle against austerity in Europe organising no less than 35 general strikes over the last four years. SYRIZA will be under tremendous pressure and there may be those within SYRIZA that succumb to those pressures. Should there be such a capitulation by the party as a whole then this would be a disaster for Greece, and would also be an enormous setback for the European Left project. It is a situation that we must all work to avoid by extending active solidarity and support. The defence of a workers’ government in Greece will not just be a test for those in SYRIZA itself but it will be a test for all who consider themselves socialists across Europe. A defeat in Greece will open the path to Golden Dawn, an openly neo-Nazi organisation and that would strengthen reaction across the continent. It will be the responsibility of the labour and trade union movement here and elsewhere to come to the aid of this government. We will need to support the measures it takes and work to strengthen it against its enemies, to help it withstand those pressures. We will need to build international networks of support and political and material aid. In 2011, the Greek resistance veterans Mikis Theodorakis and Manolis Glezos launched a ‘common appeal for the rescue of the peoples of Europe.’ This appeal called for a united European front of action to turn back the tide of austerity sweeping through Europe. In Britain, that appeal led to the founding of the Greece Solidarity Campaign (GSC). The GSC has built strong links with the movement in Greece. We have organised a number of important delegations and have organised solidarity aid through our Medical Aid to Greece campaign. The Trades Union Congress and many individual unions support the work of the GSC. The ground has been prepared for the scale of solidarity that is required. The movement in Britain is well placed to engage with the work of supporting the people of Greece in what will be their hour of need. Support for a government of the Left in Greece will also come from the new parties of the left throughout Europe including our own party, Left Unity. Our recent party conference took the decision to become a sister party of SYRIZA through seeking affiliation to the European Left Party. We will rally to support a government that promises to break with austerity. We must all now urgently rise to this challenge. Solidarity I will try to get my Union to do what we can. Let me know what is needed. It was just Churchill (and Roosevelt) that assigned Greece to the Western ‘sphere of influence’ at Yalta but Stalin too. Good analysis Andrew. it is quite true that many of us on the radical Left have major reservations about the rightward, “accommodationist” drift of Syriza policy over the last 18 months, but we all have to recognise that , being so politically far ahead of even the rising tide of mass resistance to austerity in Spain and Portugal, and far ahead of the rest of us, and with such a small, weak , economy, an incoming Syriza government will be facing an extraordinarily tough challenge. To retain its , only recently acquired, mass supporter base a Syriza government will need to deliver a decisive socialist programme – but the further Left it goes – the more rabid will the internal and external economic sabotage and “market punishment” get. There will be definite echoes of the experiences of the 1970’s Chilean Allende government ahead for Greece if a Syriza government is elected. As you say, despite any political criticisms , the duty of all socialists must be to offer unconditional support to a future Syriza government, and the Greek working class.The election of a radical Left socialist government in Europe will be the most momentous , potentially political avalanche – starting, event since the 1974 Portuguese revolution, and this time in a wider European context of extraordinary opportunity (and hazard) for the entire European working class. 1. Eventual SYRIZA’s government will NOT be a workers’ one since the party has extremely weak links with the working class. It will be a bourgeois government. Furthermore if SYRIZA was looking forward to the working class movement they wouldn’t undermine every single working class struggle. They would support strikes not defeating them from inside and certainly, they would NOT propose to the workers just to stay calm and wait for the elections, whenever the governing bourgeois parties would find it convenient to proclaim. 3. SYRIZA does NOT speak about increasing salaries or pensions but only about stop decreasing them. Instead they do speak about restoring the minimum salary to 750 Euros (now in 580) a measure which, unsurprisingly, the industry bosses union (???) strongly recommends. 4. SYRIZA declares in every opportunity that Greece is a partner to EU and NATO and that this is beyond any question. . They claim to be partners not enemies with them. They want, as they say, deals not one-sided decisions. There will be no collision with Brussels’s directorate under these terms: a collision is one-sided decision after all! All too very true paranagnostis. SYRIZA are NOT “radical left” – they have no radical policies. Simply putting “radical” in a party’s name (or “socialist” in the case of PASOK) doesn’t make it so. SYRIZA are further right than even PASOK were in the 80s, which is why they have become a home for so many ex-PASOK supporters, and why SYRIZA is increasingly known as “New PASOK Lite”. Without an economic programme of ‘less work but work for all’ the 30% unemployed may have ‘debt’ cancellation but it will bear no actual effect on their lives as new jobs ain’t going to be created in an EU which is mired in economic austerity. 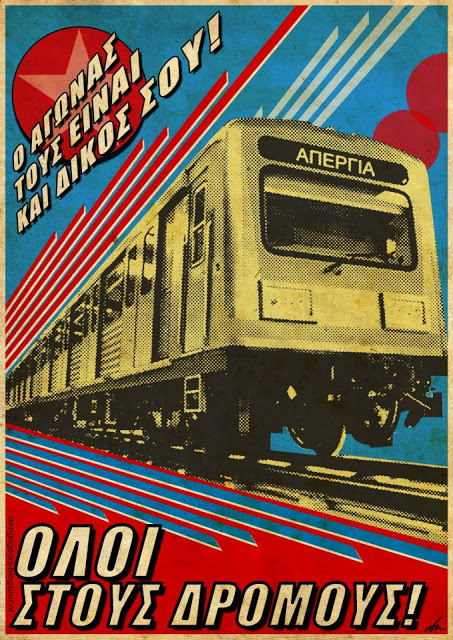 Irrespective of the wishes/desires of the Syriza leadership and to whether they accommodate or not to capital, without a return to a national currency and an exit from the EU, restoring national economic production will be a pipedream if everything has been privatised and sold off to large transnational corporations. Hence the Left Platform within Syriza will grow if anti-working class measures are openly taken as a mass movement will re-emerge. The banksters are in retreat, the issue is whether this retreat can be utilised to turn it into a rout. It is now a matter of self esteem for the Greeks. We need to kick the Troika out, we need to tell Merkel to back off. We are better off poor but with out dignity intact, than humiliated day after day for the expansion of Das Kapital’s Geldlebensraum. Only last Thursday the unelected European Commission’s president, Jean Claude Juncker, suggested on Austrian TV that the Greeks will do well to think twice before voting and make sure they don’t vote wrongly, for he’d much prefer to see familiar persons emerging from the inevitable elections. Modern politics started with Greece and in an ironic way they are again pointing to Athens. The word is hubris. We have to stop it, or we will be willingly submitting ourselves, and our children, to eternal slavery. What good would firing the current Commissioner do? He would be replaced by another, perhaps a smoother talking commissioner, more diplomatic,less of a loose cannon and generally less gaff prone. At least Juncker is easy mock and makes the Commission look bad. ;) Honestly, the legislative and executive should really be combined (Trotsky made a general point about France that the legislative and executive should be combined in a *programme for action in France*), in other words, get rid of the commission altogether and combine the legislative and executive functions, only this time, unlike Trotsky talking about 1930s France, we can demand that on a European level. Andrew argues that we MUST support Syriza and for many of what seem to be the “right reasons”. For example, anti-austerity reasons… Yet, he won’t countenance our support of TUSC in the upcoming British General Election and woe betide anyone who suggests Left Unity actually joining and contributing to a similar coalition of radical left parties and activists – Why is that, I wonder? So , as of today, 29th January, with the failure to elect a new president, a snap election in Greece is indeed on the cards ! Dramatic days and years of both political hope, but also potential disaster, ahead in Greece – and by its massive “inspiration and political spillover ” effect , dramatic times ahead for Europe. The “markets” will already be imposing their malign influence on the Greek economy, as even more capital flight , and general speculation, occurs ahead of the election. Syriza is not a revolutionary party, indeed it is a pretty shambolic coalition across quite a broad political spectrum – so a Syriza government will look much more like the early 1970’s tragic radical social democratic Chilean government of Salvadore Allende than anything further Left. Nevertheless the duty of all serious socialists will be to give whatever support we can to this radical break with the pro-Austerity consensus and “narrative” – it could set off a Left political landslide in other European countries -particularly Portugal and Spain. If the future Syriza government seriously miss-steps in its tactics – and fails to build on working class hopes with solid socialist policies, Greece could very easily eventually fall once more under the iron fist of the generals and their fascist street allies. Ally Macgregor, you surely must be aware that Left Unity’s Conference decided to be very flexible, on an area by area basis about our branches entering electoral partnerships with TUSC ? In quite a few areas this is in fact happening. You are surely aware however that TUSC is no sort of real political party, or even a broad electoral alliance – but really mainly a front for the Socialist Party of England and Wales (SPEW) – ex Militant Tendancy/RSL ? With a bit of SWP tepid support, and purely top-down RMT union funding (that must be in doubt with the death of Bob Crow). Left Unity is a proper political party, a bit too new to be putting up many candidates in the 2015 General Election – but our opportunity for real growth will come (if we don’t collapsed into petty Left nationalism or mutual bickering) over the life of the next disastrous , Austerity enforcing, Parliamentary term (whichever political mainstream party or coalition, is in office). Syriza is a coalition of parties – now recently grouped more formally into a cobbled together, rather leadership dominated , single party structure. It is not akin to the transient, elections only, undemocratic, member party bloc vote, structure of TUSC. TUSC also has a populist reactionary policy on the EU, and immigration, and on many issues, no policies. It is an electoral lash-up – which will poll derisory figures in the General election. We need to build a real long term mass party of the Left in the UK. This party needs to be open and democratic – one member – one vote. We need to get well away from all the old Trot front organisation structures to build such a radical Left mass party. European politics is entering a brand new era of fast radical change. The UK Left can only be a part of that transformation of Left politics if we embrace the need to escape from all the old small sect dogma and secretive, dishonest, front-based politics of the failed vanguardist Far Left party models. Syriza and Podemos are part of this wave of the future. They are indeed deeply flawed in their woolly reformism, but they could well open the political door to a mass Left radicalisation of the European working class that we have not seen for many generations. Germany’s leadership believe we are in 2012. We are not. The fear of Grexit and the rise of Syriza have existed for 3 years. Same threats do not apply to electorate. Rightwing in Greece grew up in cold war era with tales of the “communists will take your houses (wives, daughters etc.)”. Now they complain Samaras is doing it in practice. New Democracy will be unable to hold onto its electoral base and will not find a new one however many votes PASOK or Potami get.